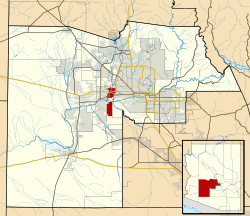 Avondale is a city in Maricopa County, Arizona, United States, adjacent to Phoenix, Arizona. According to the 2010 census, the population of the city is 76,238. Avondale, incorporated in 1946, experienced rapid residential and commercial growth in the years since 1980. Once primarily a sparsely populated farming community with many acres of alfalfa and cotton fields, Avondale has transformed into a major bedroom suburb for Phoenix. Several major residential subdivisions and shopping centers have recently been built on former farmland, many adjacent to Interstate 10. Phoenix Children's Hospital opened a satellite facility (the Southwest Valley Urgent Care Center), at the corner of Avondale Boulevard and McDowell Road in the spring of 2013. Avondale's main arterial streets leading into the city of Phoenix, including Van Buren Street and McDowell Road, have been widened and modernized to a more "suburban" and less "rural" appearance and function. Avondale is located at (33.435322, -112.349758). According to the United States Census Bureau, the city has a total area of 41.3 square miles (107 km2), of which, 41.3 square miles (107 km2) of it is land and 0.1 square miles (0.26 km2) of it (0.15%) is water. This area has a large amount of sunshine year round due to its stable descending air and high pressure. According to the Köppen Climate Classification system, Avondale has a Hot desert climate, abbreviated "Bwh" on climate maps. The initial point of the Gila and Salt River Meridan. Period of significance: 1850-1874.The surveying marker of the Gila and Salt River Meridan is located on Monument Hill. Ever since 1851, this has been the center point used by the state to measure the land in Arizona. The federal government recognized this point for measuring the boundary between the United States and Mexico after the Mexican-American War ended. The first survey conducted in 1867, involved the first 36 miles of Arizona. Up until 1874, this was the epicenter of all surveying in Arizona for property deeds. It was listed in the National Register of Historic Places on October 15, 2002, reference #02001137. Monument Hill is located at 115th Ave. and Baseline Road in Avondale, Az. Historic Monument Hill. This is where the initial point of the Gila and Salt River Meridan is located. National Register of Historic Places marker on Monument Hill in Avondale Az where the initial point of the Gila and Salt River Meridan is located. 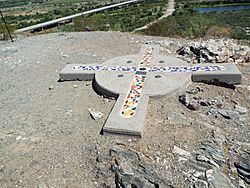 Marker of the initial point of the Gila and Salt River Meridan on Monument Hill in Avondale. The following is engraved on the round marker: U.S. Department of the Interior Bureau of Land Management. Initial Point of Establishment in 1865. Gila and Salt River Meridian, Arizona. Cadastral Survey. The rectangular marker states the following: Dedicated to all land owners in Arizona by the Arizona Professional Land Surveyors originally set by A. B. Gray in 1851. Different view of the initial point of the Gila and Salt River Meridan . Gila River as viewed from the summit of historic Monument Hill. Avondale, Arizona Facts for Kids. Kiddle Encyclopedia.